When April arrives, wine lovers from all over Southern and Central California start planning for the Santa Barbara County Vintners’ Festival, one of the most popular wine festivals in the state. 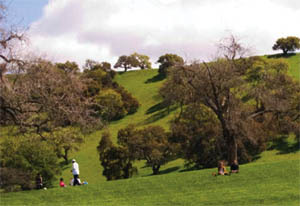 In years past, the festival has been held at Firestone Meadow on Foxen Canyon Road. This year, however, the event has moved to a new location just outside Lompoc-River Park, a sprawling 97-acre space at the gateway to the Santa Rita Hills appellation. The township of Lompoc vied for the opportunity to host this acclaimed wine festival, and its diligence and enthusiasm has paid off: Saturday, April 21 (from 1-4 p.m.), will be the city’s day to shine as the new host of this annual event. The membership of the SBCVA, which includes more than 80 wineries, agreed to move to River Park and the buzz is this new location will provide attendees with a different way of viewing Santa Barbara County wine country. While the Firestone family made it possible for past attendees to celebrate wine in the middle of Santa Ynez Valley, the River Park location will introduce festival-goers to the Santa Rita Hills appellation, which runs mostly along the Highway 246 corridor and Santa Rosa Road. Known primarily for its pinot noirs, chardonnays, and cool-climate syrahs, the Santa Rita Hills appellation is recognized the world over for it wines. Wineries there include Melville Vineyards and Winery, Clos Pepe Vineyards, Foley Estates Vineyard and Winery, and Alma Rosa Winery and Vineyards. For those who don’t want to drive onto festival grounds on their own, buses will be available at the Royal Scandinavian Inn in Solvang, the Holiday Inn in Santa Maria, and Fess Parker’s DoubleTree Resort in Santa Barbara. I recommend purchasing the Combo Ticket, which, for $100 per person, includes a round-trip bus ride from any of the above locations and a festival ticket. When you consider the price of dinner at some of our finer Santa Barbara County restaurants, the $100 price tag is actually quite reasonable for what you get. So, what do you get for that price? Are you a syrah lover? A pinot lover? A sangiovese lover? How about tempranillo? Cabernet? You’ll find them all at the S.B. County Vintners’ Festival. And you will be received by some of the most esteemed vintners in the United States. Winemaking legends such as Bill Wathen (Foxen), Rick Longoria (Longoria), Jim Clendenen (Au Bon Climat), and Greg Brewer (Melville) can be found pouring their wines at well-attended booths. There will be new, up-and-coming winemakers there as well. Don’t forget that some of the most sought-after wines in California today originate in our soils. There will also be live music, informational booths about growing and making wine, and plenty of shady places to enjoy, while reclining with that perfect glass of vino. The Santa Barbara County Vintners’ Festival takes place on Saturday, April 21 from 1-4 p.m. For more info, visit sbcountywines.com.